There is something rousing in today’s readings. For those uninitiated to the literary genre employed called apocalyptic writing, there is a “clear and present danger” of being led to fear, not peace of mind. After all, Jeremiah’s words were set historically amidst the context of a city – Jerusalem – under siege. We need to sift the chaff from the grain. We need to see the message as distinct from the medium. We need to be a little literary sleuth in order to get the all important content and discard the non-essential context that acts as wrapping or prop for that one important message. And that message for today, the first day of Advent, is simply this: the Lord is coming! That was the basic message of Jeremiah. But in order to get the attention of his listeners, he had to frame his message in the very real, existential context of their “sitz im leben,” their life situation, their current phenomenological experience! They were a people under siege. And a people under siege needed to hear words of promise and comfort, not fear. They needed to reminded that behind all those sufferings and trials they were facing, there is one undeniable certainty that is bound to take place according to the will of the God they believed and hoped in. “The days are coming, says the Lord, when I will fulfill the promise I made to the house of Israel and Judah. In those days I will raise up for David a shoot; he shall do what is right and just in the land.” Number 1 message for today, therefore, has to do with the promises of the Lord. They are soon to be fulfilled! Promises… coming… waiting… these are important concepts to “sit sazen” with today (read: contemplate on in solitude). 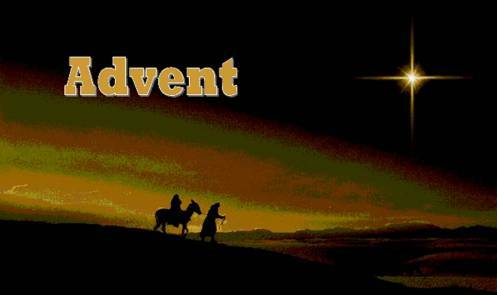 Advent has to do with all three – and more! Advent has to do with waiting, not in fear, but in hope, for the promises of the Lord will soon be fulfilled. Our basic catechism has taught us at least these two things: one … historically speaking, the Lord has come. He was born of the Virgin Mary and became man like us (Christmas). Second, he still comes to us now in grace through the ministry of the Church and the sacraments (liturgy). These constitute the “already” of our faith – reality that has unfolded and still unfolds. But there is a third reality that we all still await – the “not yet” of our faith – his definitive coming to bring the fullness of salvation, the “reality” behind the symbolic cataclysmic, world-ending events we have grown accustomed to hearing yet not fully understanding! What, then, do we make now of all this? What impact do these promises of his definitive coming have in our personal and societal lives as Christians, as catholics? To be very honest, we also live in the context of so many little versions of these “world-ending” events. Our world seems about to end when we lose hope, when we lose our composure and our sense of equanimity and interior peace when things do not go according to our expectations. Our little world seems to collapse when we get sorely disappointed when dreams do not come true, when plans fall flat on their faces, and our best intentions are even misread, misconstrued, and even rash judged by others. Our world collapses when we do not get that much-coveted position, job, or esteem from others. People fight little wars inside themselves, apart and beyond the wars being fought in Iraq, Afghanistan and everywhere there is the modern-day scourge of threats of terrorism. People fight fruitless wars of mutual envy, hatred, and broken relationships in and out of family systems, in politics, in businesses and in so-called civil society. Millions are currently fighting terminal and painful illnesses that are totally unexpected and definitely unwanted. In other words, there are all the reasons available to be less than optimistic and downright hopeless about the future. Cynicism can pervade our hearts and minds as we see ourselves powerless and helpless before so many problems in the world, particularly in the arena of politics and government. This is where Advent liturgy can help us. Perhaps we can get a clue from St. Paul in his letter to the Thessalonians. Today, he offers us two things: a prayer/wish for all of us, that the Lord may make us “increase and abound in love for one another,” and, an exhortation that we may “conduct ourselves to please God.” The original word used for “conduct” really was peripateo, which means to walk according to the ethical and moral standards of Christ. Here, then, we have an invitation to walk in the way of Christ, to follow, in particular what we may call an Advent way of life. Promises, coming, waiting are all words that beckon us to be hopeful. But all this hoping is not a type of waiting done by people who cannot do anything more than being passively resigned. It is a type of waiting that has been roused by a certain very real urgency. That type of active waiting is what the Lord’s words today ought to lead us to: “Beware that your hearts do not become drowsy from carousing and drunkenness and the anxieties of daily life, and that day catch you by surprise like a trap.” Advent way of life is a waiting that is not like the waiting of someone who somehow hopes to strike it rich by winning the lotto. Advent waiting is not like the waiting of someone who somehow hopes terrorism and wars will end someday. Advent waiting is not just passive anticipation at best, or cynical resignation, at worst. Advent waiting, the advent way of life is to walk, to move, to work so that what we hope for becomes a reality in our lives. That means concretely, peace and justice becoming real and palpable in our families, in our parishes, and in our communities. I add two big words for all of us to reflect on today: anticipation and incarnation. Advent waiting simply put, is not just anticipating something, like children anticipate passively and longingly Santa Claus’ gifts from the list they are now making or have made already. No, advent waiting has to do with incarnating the reasons for our hope. It has to do with acting, behaving and doing in accordance with the hopes that we have in our hearts. It means not only being forward-looking, but also, being forward-moving. We all long for peace, justice and love. We all wait for that definitive coming of the Son of Man, for the real end-times, for the time, when “there will be no more tears, no more crying, no more pain.” But as we live in this “in-between” time that is the here and now, as we wait actively in hope, we just have to contribute and work to make all that happen in the here and now. It means being a little more focused, being a little more kind and gentle and understanding, being a little more aware of the gentle, unassuming presence of God in our daily lives. The saints have shown us the way. Sanctity is not in the unusual, the other-worldly, the unreal. Sanctity is in the daily realities of life. Sanctity, Wicks writes, is found in ordinariness. “Ordinariness is palpable holiness.” St. John Bosco said the same thing long ago. Talking to St. Dominic Savio, he said that sanctity consisted in doing one’s ordinary duties, extraordinarily well. Simple yet profound. In daily ordinariness, we wait for the fulfillment of the Lord’s promises. But as we wait, we walk with the Lord along the way of his commands, along the paths that lead to peace. Kamusta po Padrey...napaka ganda po ng inyo'ng pagninilay ito po ay nakatulong ng malaki sa hinaharap kung krisis ngayun na ako rin ang makakasagot. Maraming salamat at naliwanagan ako sa minsahe na inyo'ng nais iparating para sa lahat.